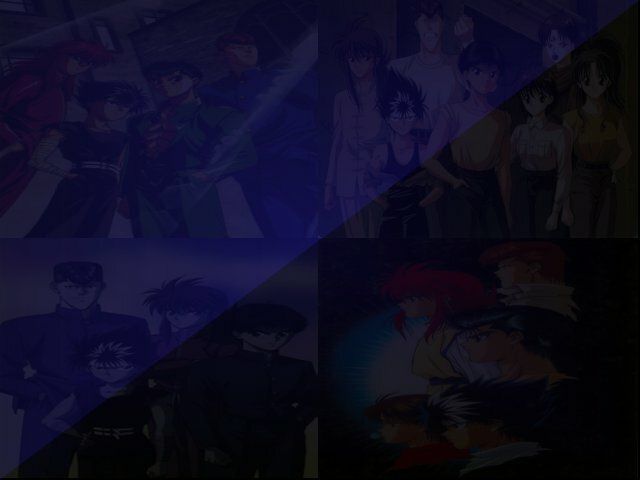 Kurama starts to recover from his wounds, and out of nowhere Kuwabara springs out and begins showing off to the gang how strong he has gotten (heck he placed third in Genkai's competition) he starts to unleash his rei ken (spiritual sword) and, to impress everyone he starts enlarging the sword until it crushes the ceiling. However, nobody was impressed (aside from Koenma who was shocked) and then Kuwabara faints (exhausted from his display of power). Yusuke calls Botan on his communicator to query about the situation back at the human world and Botan says that things are getting pretty worse as she gets chased by another possessed person and smacks him down with her baseball bat. (Kuwabara regains consciousness by the way upon seeing Botan) then the place suddenly begins to crumble as the gang runs out to the clearing. There they meet the next demon they have to face, Byako, a tiger-demon. Hiei was about to face the monster but Kuwabara breaks in and tells them that he will beat the monster with his powerful spiritual sword (right) and displays his power again.. but even the tiger-demon Byako laughs at the puny display of energy. Byako then summons four mini-tiger demons from his hair and the tiger confronts Kuwabara. Kuwabara tries to attack the tigers with his sword but they are much too fast for him, as the four tigers slaughter him and Kuwabara goes down badly wounded. Yusuke begs for Kuwabara to give up the fight and let them handle the situation, but Kuwabara's pride stands up and he refuses to do so. Just then he thinks of a plan, and suddenly runs back to his comrades. Byako laughs as Kuwabara finally thought of retreating, as the mini-tigers follow him straightly. But Kuwabara's plan is about to begin as he confronts the tigers, who has followed him running and has now lined up in front of him in a straight line, and there he uses his spiritual sword and makes it longer, nailing all four in one straight attack.. however the tigers are much too powerful and they still continue to force their way out of the sword, so Kuwabara to decides to give chase once again, but this time he goes round in circles and traps the four tigers around his sword, leaving them stucked for good.